At the forefront of surveillance imaging development and performance, 360 Vision Technology, is proud to announce that it is now employing the latest high-performance Sony STARVIS™ 1080P HD camera module across its entire range of HD surveillance cameras. Featuring the latest generation of imaging sensors specifically designed for surveillance camera applications by the world’s leading electronic component manufacturer, the new Sony camera module includes STARVIS™ CMOS image sensors with back-illuminated pixel technology. 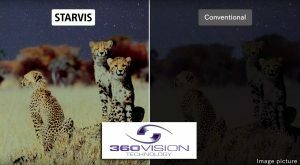 360 Vision Technology is one of only a handful of partners selected by Sony worldwide to use the latest Sony STARVIS™ technology – securing sufficient stock to supply customers throughout 2016 (despite a natural disaster affecting Sony’s factory output). The latest Sony STARVIS™ camera module includes Auto ICR, Spherical Privacy Zone Masking, and Defog – to provide the ultimate in scene detail, colour rendition and ultra low-light performance. A built-in image stabilizer function counters the effect of blurred, shaky images caused by low-frequency vibration. This is designed to ensure quality images in outdoor surveillance and traffic monitoring applications – particularly if the camera is used on a mounting pole or bridge where it may be subjected to wind or mechanical vibration. The camera module’s state-of-the-art optical/digital zoom is combined to enhance picture quality – while maintaining the original horizontal angle of view. This technology ensures no compromise in image size, and reduces blurring. Sony STARVIS™ features a sensitivity of 2000 mV, or more per 1 µm2 (colour product, when imaging with a 706 cd/m2 light source, F5.6 in 1 s accumulation equivalent).